This research explores the outcome of positive visual reframing (PVR), a single session intervention where drawn images of negative experiences and open memories were redrawn and visually reframed to form new positive narratives. The study hypothesised that PVR would lead to improvements to positive and negative affect, self-efficacy and the perceived intensity and perceived resolution of a selected negative experience. Healthy adults (n = 62) were randomly assigned to the PVR or control condition. For the experimental group, statistical significance was identified for positive affect and the perceived intensity and resolution of the negative experience immediately following the PVR activity. Self-efficacy was marginally significant. The findings highlight the potential of positive visual reframing to enhance emotional regulation when negative emotions are triggered. At two weeks’ post-intervention, improvements were identified in both conditions. This suggests that over time, the visual and sensory exposure created by drawing a negative memory may also lead to positive gains. The study emphasises the potential of PVR to regulate emotions and defuse the intensity of negative or open memories by visually transforming a moment of peak perceptual intensity. Future studies exploring the effectiveness of positive visual reframing to shift negative emotions in clinical and non-clinical populations are recommended. Se exploran los resultados de la reformulación visual positiva (RVP), una intervención en la que imágenes de memorias abiertas y experiencias negativas son reformuladas visualmente para formar nuevas narrativas positivas. El estudio plantea la hipótesis de que la RVP conduciría a mejoras en el afecto positivo y negativo, autoeficacia e intensidad y resolución percibidas de experiencias negativas. 62 adultos sanos fueron aleatorizados a condiciones de RVP o control. Se hallaron mejoras para el grupo experimental en niveles de afecto positivo, así como intensidad percibida y resolución de la experiencia negativa inmediatamente después de completar la actividad de RVP. Estos hallazgos ponen de relieve el potencial de la RVP para mejorar la regulación emocional cuando se activan emociones negativas. A las dos semanas se identificaron mejoras en ambas condiciones. Esto sugiere que, con el tiempo, la exposición viso-sensorial creada al extraer un recuerdo negativo también puede conducir a mejoría. El estudio hace hincapié en el potencial de la RVP para regular emociones y difuminar la intensidad de un recuerdo abierto mediante la transformación visual de un momento de máxima intensidad perceptual. Se recomiendan estudios que exploren la efectividad de la RVP para cambiar percepciones negativas en poblaciones clínicas y no clínicas. Negative experiences are something we all share and generally arise as a consequence of emotionally charged social interactions and events (John & Gross, 2004). When attempts to understand and explain the meaning of a negative experience are successful, we generally find closure and move on (Wilson, & Gilbert, 2008). Otherwise, the experience remains ‘open’ and is easily triggered by reminiscent experiences and emotional and visual cues (Lazarus, 1991). Described colloquially as ‘unfinished business’ (Beike, & Writh-Beaumont, 2005), open memories are problematic for a variety of reasons. For one, open memories contain high levels of emotional detail, emotional significance, and information, which when combined greatly increases the likelihood the memory will be maintained (Conway et al., 1994; Peeters, & Czapinski, 1990). Because negative memories are perceived as self-relevant, they lead to intensified affective reactions upon recall (Frijda, 1988) and challenge effective emotional analysis (Metcalfe, & Mischel, 1999). As these memories contain more complex and less coherent narratives than closed or positive memories (Bohanek, Fivush, & Walker, 2005), the negative uncertainty of open memories further enhances negative emotions (Bar-Anan, Wilson, & Gilbert, 2009) and perpetuate questioning about ‘why’ the experience happened (Abele, 1985). Finally, because open memories are so accessible they make substantial contributions to current feelings and decision-making (Beike, & Writh-Beaumont, 2005). As humans are highly motivated to make sense of themselves and their experiences, these poorly understood negative memories are also perceived as a source of threat (Wilson, & Gilbert, 2008). This means when triggered, open memories receive priority cognitive attention (Allport & Postman, 1946; Malle & Knobe, 1997) and are automatically selected for processing and appraisal at the expense of working memory performance (Klein & Boals, 2001; Curci Lanciano, Soleti, & Rimé, 2013). To respond to the demands of a difficult emotion, open memories activate a range of emotional-regulation strategies (Ochsner, & Gross, 2005). Cognitive reappraisal, for example, is an adaptive regulation process, whereby reframing an event is used to diminish emotional impact and shift a negative trajectory of response (John, & Gross, 2004; Lazarus, & Alfert, 1964). Demonstrating the benefits of adaptive emotional regulation strategies, frequent use of cognitive reappraisal is related to higher levels of positive and lower levels of negative affect and is positively related to mood repair. Habitual reappraisers also display high self-esteem, high optimism and fewer depressive tendencies (John, & Gross, 2004). Like cognitive reappraisal, positive reframing is a regulatory process of perceiving an experience or event previously regarded as negative within a new context or framework (Lambert et al., 2009). Although both cognitive reappraisal and positive reframing are generally understood as outcomes of disposition and personality traits (Pakenham, & Cox, 2008; (Lambert et al., 2009), researchers argue there is promised to be had by interventions that can highlight functional emotional regulation strategies (Ehring, Tuschen-Caffier, Schnulle, et al., 2010). Whereas positively reinterpreting negative experiences provides an adaptive response that boosts coping resources (Lyubomirsky, Sheldon, & Schkade 2005), intervention studies exploring positive reframing of open memories have had limited empirical attention. Instead, research on open memory closure has largely focused on emotional venting through expressive writing paradigms (Pennebaker, 1993). An important exception to this somewhat negatively focused strategy is Watkins, Cruz, Holben, and Kolts (2008) who demonstrate the positive impact of grateful written processing on open memory closure. Despite a research emphasis on expressive writing for negative memory closure, it is important to note that memories and experiences are generally summarised as visual images (Conway, 2009; Holmes & Mathews, 2010) and that negative and traumatic memories are encoded as sensory perceptions (van der Kolk & van der Hart, 1991). Subsequently, as emotional systems both respond to and store information using sensory-based formats, these systems may actually be less responsive to non-sensory based interventions that use higher order level conscious processing such as language and writing (Holmes & Mathews, 2010). Based on this conclusion, as negative open memories arise from and are recorded as visual experiences, they might actually require sensory-based, (ie. visual) interventions to shift deeply rooted emotional responses and perceptions (Holmes, Arntz, & Smucker, 2007; Mathews, Ridgeway, & Holmes, 2013). Furthermore, as image-based memories are considered fragile (Beike & Writh-Beaumont, 2005), malleable (Conway, 2009; Holmes & Mathews, 2010) and progressively reconstructed over time (Torralba, & Oliva, 2003), drawn visuals might provide an especially synergic approach for reframing and supporting memory closure. Additional support for the viability of visual interventions comes from studies that show art-making enhances positive mood (Bell, & Robbins, 2007; De Petrillo & Winner, 2005). A positive mood, in turn, leads to increased levels of mental flexibility and creative thinking (Forgas, 1998; Isen, 2002), facilitates cognitive processing (Taylor, 1991) and primes for cognitive change (Kuvaasa, & Selart, 2004). Therefore, given the tendency of open memories to deplete cognitive resources (Klein, & Boals, 2001; Curci et al., 2013), there is an additional argument for the mood-enhancing quality of visual interventions to bolster the cognitive resources open memories drain. Finally, whereas meaningful and relevant visual cues can unconsciously activate negative emotional responses (Öhman, & Mineka, 2001; Folkman, Lazarus, Dunkel-Schetter, DeLongis, & Gruen, 1986), visual cues can trigger positive emotional responses as well (Latu, Mast, Lammers, & Bombardi, 2013; Winkielman, Berridge, & Wilbarger, 2005). In related evidence, the effectiveness of venting negative experiences through drawing and writing is investigated in several empirical studies. Chan and Horneffer (2006) (n = 63) for example, found that in the short term, drawing meaningful negative experiences elicited stronger negative emotions and was less effective in decreasing social dysfunction than writing about them. Contrasting findings by Pizarro (2004) (n = 45), which show in the short-term writing about trauma leads to higher levels of negative affect than drawing, suggests research is inconclusive in this area. However, when the valence of drawn imagery is shifted from negative to positive or benign, interesting shifts arise. Using positive-themed drawn imagery to distract attention away from a negatively induced mood was found more effective than using drawn imagery to vent negative feelings (Dalebroux, Goldstein, & Winner, 2008; Drake & Winner, 2012). This suggests positive-focused drawing may have benefits over negative-focused drawing. However, neither venting nor positive distraction was sufficiently effective, in the short term, to reduce the negative arousal created by either an induced negative mood (De Petrillio & Winner, 2005) or an authentic open memory (Dalebroux et al., 2008). Subsequently, defusing negative arousal may require a more meaningful strategy than venting or positive distraction currently provide. Finally, it is plausible that like expressive writing, negative arousal in the short-term is a necessary requirement of longer-term positive gain (Pennebaker, Kiecolt-Glaser, & Glaser, 1988). Empirical studies exploring the use of drawn visual imagery to tackle negative experiences are limited but include Mercer, Warson, and Zhao (2010), who used a single group (N=10), test-re-test design and a range of intervention techniques to explore the impact of drawing benign versions of work-related stress. Findings showed that while positive affect remained unchanged, anxiety and negative affect decreased. In contrast, Holmes and Mathews (2010) found that imagining benign, ambiguous outcomes to a negative experience was ineffective at decreasing anxiety, yet was later remedied when participants imagined unambiguously positive resolutions. In a more recent study, healthcare professionals (n = 35) took part in a multi-levelled intervention using drawn imagery to de-stress (Huss & Sarid, 2014). Measures indicated that between pre and post-intervention, subjective levels of discomfort were halved. The authors argue their finding lends support to links between the transformation of imagery and the transformation of subjective states. They further propose that image-transformation may lead to perceived control and provide a trigger for a more relaxed emotional state. Although not specifically highlighted, like Mercer et al. (2010) it is also plausible that as based on peak and end theory (Fredrickson, 2000), visually defusing a moment of peak intensity led to new, less negative perceptions of the experience’s ending. While each of these studies has their limitations (lack of control group or randomisation, small sample sizes, or the challenge of extracting key impacts from a multi-intervention focus), for the current research they provide an important springboard for exploration. At present, drawn image-based interventions are an underexplored area of quantitative investigation, particularly within non-clinical populations and currently lack representation in intervention-led fields such as positive psychology. To address this gap in the literature, the present study explored the impact of Positive Visual Reframing (PVR) - described here as a functional emotional regulation strategy that uses drawn visual imagery to positively reframe and defuse negative emotional experiences. The study hypothesised that after producing an image of an open memory or negative emotional experience, healthy adults who used drawn visual imagery to positively reframe their memory’s narrative would have higher scores on positive affect, self-efficacy and perceived resolution and lower scores on negative affect and the perceived intensity of the experience than a control group who undertook a neutral drawing activity. Due to a shortfall of empirical studies on drawn image-based interventions, the present research was designed as a randomised control trial to explore between-group and within-group outcomes. The research was developed as a practical and deliverable intervention through which the impact of a single independent variable (positive visual reframing) could be assessed as a stand-alone activity. The dependent variables, positive and negative affect and self-efficacy were selected as clear indicators of emotional regulation and positive psychological gain. Ordinal scales measuring the intensity and resolution of the negative experience were included to add a richer nuance to the findings of the intervention and provide clear data on perceptual shifts. Demographics, including the age of the negative experience, were also included in the design. Participants were healthy adult volunteers (n = 62) of working age living in the UK. A total of 46 females and 14 males took part in the study. Two participants did not identify their gender. See Consort Flow Diagram (fig. 1) and baseline characteristics (Table 1). Figure 1 Flow diagram of the study. Over a three-month time-frame, participants were recruited widely by the principal investigator through Facebook, LinkedIn shares, and call-outs for volunteers in various organisational, educational and vocational newsletters. A sample size of 60+ participants was selected as, accepting an alpha risk of 0.05 and a beta risk of 0.2 in a two-sided test. At least 29 subjects were needed to recognise as statistically significant a difference greater than or equal to 0.5 standard deviations, assuming a correlation coefficient between the initial and final measurement of r = 0.8. All participants received an introductory letter and a consent form prior to taking part in the study. A copy of a sealed, coded and shuffled intervention pack, randomly allocating subjects to the experimental or control condition was distributed to participants. Each pack contained written instructions, blank white A4 paper, study measures for Time-1-3 and Time-4 (two weeks’ post-intervention) and a postage-paid return envelope for returning the data. The two-week follow-up time frame was selected as representative of when short-term intervention benefits generally wane (Semmer, 2008). The study was double-blinded as neither the researcher nor the participants knew which packs participants would receive. The design of the control and experimental activities aimed to encourage both groups to view their activity as the main focus of the study. To counter the influence of participant bias or priming, participants worked independently and self-selected a time and location to complete the study. The healthiness of subsects to take part in the study was assessed using Warwick-Edinburgh Mental Well-being Scale (WEMWB) (Tennant et al., 2007). The WEMWB is a validated, ordinal scale measuring mental health across 14 descriptive phrases. For the purposes of this study, well-being was defined as “the balance between an individual’s resource pool and the challenges faced” (p. 230, Dodge, Daley, Huyton, & Saunders, 2012). Positive and negative affect were measured using the Positive and Negative Affect Schedule (PANAS) (Watson, & Clark, 1988). Positive affect is described as a high state of concentration, energy, and pleasurable engagement while negative affect is described an aversive mood state of unpleasurable engagement and distress ((Watson & Clark, 1988). Self-efficacy was measured using the Generalized Self-Efficacy Scale (GSE) (Schwarzer & Jerusalem, 1995). Self-efficacy is concerned with an individual’s perceptual belief in their own capabilities and influences how people think, feel and behave (Bandura, 1977). Following written instructions, study participants completed Time-1 baseline, measures for positive and negative affect using the PANAS Scale (Watson & Clark, 1988), mental well-being using the Warwick-Edinburgh Mental Well-being Scale (WEMWB) (Tennant et al., 2007), and self-efficacy using the General Self-Efficacy Scale (GSE) (Schwarzer & Jerusalem, 1995). Next, using a pencil and blank paper, participants in both conditions created an image, doodle or diagram of a negative experience, open memory or challenge. After completing and reflecting on the negative image, all participants completed Time-2 measures for positive and negative affect, self-efficacy, ordinal scales on the perceived intensity and perceived resolution of their image’s memory and details of the experience’s age. At Time-3, the experimental group used positive visual reframing to positively change the narrative of their image by drawing over the initial pencil drawing with a black pen or felt-tip and making note of and including any fresh insight in their new image. Once complete, participants used a rubber to remove any unwanted traces of the original negative pencil drawing, re-told themselves the new positive story in their mind and took a few moments to connect with any positive feelings created. The same measures used at Time-2 were then completed for Time-3. In the control group, participants covered a fresh sheet of blank A4 paper with triangles as a neutral, image-based activity, and then went on to complete the Time-3 repeat-measures. After completing the intervention, all participants were instructed to take a photograph of their final image and set it as their mobile phone’s background for a period of two weeks. This activity was selected as positive replay maintains positive emotions (Lyubomirsky, Sousa & Dickerhoof, 2006). Intervention packs were returned in postage-paid envelopes minus the drawings. These were purposefully excluded from the study to encourage participant willingness to create meaningful personal narratives and pre-empt any anxieties that drawings might be interpreted, or artistry judged. Two weeks after completing the intervention, written instructions requested participants in all conditions to mentally recall the original negative experience before completing and returning via post a final set of Time-4 repeat-measures. Upon receipt of the measures, participants received a study-debriefing sheet including a copy of the PVR instructions for control group volunteers. Baseline information was compared between groups using Chi Squared tests and t-tests. T-tests were also used to carry bivariate comparisons between the two groups at Times-2, 3 and 4. As the research included between-group factors and within group factors with repeated measures across two conditions, a mixed ANOVA was carried out with longitudinal data. Here one independent variable (positive visual reframing or control conditions) and four dependent variables (positive and negative affect, and perceived intensity and resolution, self-efficacy) were measured at 3 and 4-time points to compare interaction effects between the control and experimental condition. Table one shows Time-1 baseline characteristics for the experimental and control group. No baseline differences were detected for gender or any of the measured outcomes. Figure 2 and 3 show bivariate comparisons of experimental and control subjects at Time-2 (immediately after drawing the negative image), Time-3 (directly after completing the positive reframing activity or control activity), and Time-4 (two weeks’ post-intervention). As it can be seen, there was a cubic evolution in all variables with three follow-ups and quadratic for those gathered at times-2, 3 and 4. Table 2 shows mean comparisons between experimental groups for all outcomes measured. Statistical significant differences to positive and negative affect, as well as the intensity of the negative experience and the perceived resolution of negative experience, happened only after completing the positive reframing activity at Time-3. In this time point, the experimental group had marginally significant higher self-efficacy levels. Table 1: Gender composition of the sample and baseline psychometric scores by group. Table 2: Bivariate mean comparisons of psychometric measures along the two follow-up weeks. Repeated measures ANOVAs showed statistical significant interactions for positive affect (sphericity assumed, F(3) = 5.289, p = .002, partial η2 = .094 with a cubic interaction: F(1) = 12.554, p< .001, partial η2 = .198) and intensity of the negative experience (Greenhouse-Geisser’s F(1.748) = 8.494, p < .001, partial η2 = .143 with a quadratic interaction: F(1) = 12.327, p < .001, partial η2 = .195). For a graphic representation, please see figures 2 and 3. Figure 2 Evolution of GSE and PANNAS. Figure 3 Evolution of perceived intensity and resolution. 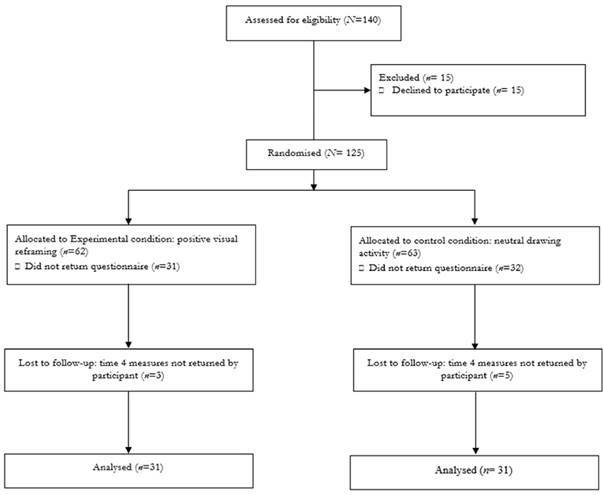 This study supports the hypothesis that after producing an image of an unresolved negative experience or challenge, healthy adults who used drawn visual imagery to positively reframe their negative experience or open memory’s narrative (positive visual reframing) would have higher scores on positive affect, perceived resolution, and self-efficacy, and lower scores on negative affect and the perceived intensity of the negative experience than a control group who undertook a neutral drawing activity. This finding was consistent immediately following the intervention and at the two-weeks’ post-intervention follow-up. In both groups, drawing the negative experience led to significant drops in positive affect. This reflects the impact of a first-person perspective that generates higher levels of emotional detail (McIsaac & Eich, 2002), and a self-immersed perspective (Libby & Eibach, 2002) that leads individuals to ‘re-live’ emotional and self-relevant experiences when a negative memory is triggered (Nigro & Neisser, 1983). Interestingly, whereas Walker, Vogl, and Thompson (1997) argue over time, negative emotional memories fade faster than positive memories, more than 50% of the participant’s selected negative experiences were between 5-10+ years old. This demonstrates the enduring negative intensity of open memories and suggests that if it were possible for participants to simply ‘think their way’ out of open memories, there had been ample time for this occur. The high age of the selected memories also emphasises the ineffectiveness of currently operating default strategies to provide closure to open memories and underscores the need for interventions that might more effectively support this aim. After drawing the negative experience, the PVR group demonstrated a range of beneficial outcomes indicative of emotional regulation. Here, departing abruptly from the control group’s experiences, the PVR group created a clear visual representation of how change might ‘look’ using the sensory language of the original experience. In the same way that sensory information is used to signal danger and trigger amygdala activity (Whalen, 1998), PVR might create an equally expedient means of shutting down amygdala activation by visually defusing a moment of peak perceptual intensity. Findings suggest PVR provides an efficient and functional emotional regulation strategy when negative emotions are triggered. It is further suggested that in defusing a perceptual threat, PVR might free cognitive space to enable fresh insight to arise and potentially unseat rigidly held negative perceptions. Furthermore, as drawing the negative experience involved venting and the control activity employed distraction, PVR demonstrated a more effective, efficient and potentially meaningful strategy for interrupting a negative response than either venting or distraction could offer. Here, the ease of access to PVR as a stopgap resource could also mean other less adaptive default strategies such as catastrophising, self-blame, and rumination (Thayer, Rossy, Ruiz-Padial, & Johnsen, 2003; Garnefski Teerds, Kraaij, Legerstee, & van den Kommer, 2004) are less likely to arise or take hold. Although visually reframing a perceptual threat might well be credited for deactivating amygdala activity, it is unlikely this was the only functioning mechanism. Cohn, Paczynski, Jackendoff, Holcomb, and Kuperberg (2012) argue that narrative comprehension relies on meaning, a moment of peak intensity, a common theme and an ending. Therefore, as open memories contain complex and incoherence narratives (Bohaneket al., 2005), visually reframing the peak action into a single and personally meaningful storyline may have also enabled a fresh (yet previously unavailable) sense of coherence (Antonovsky, 1993). Supporting the perception that life is meaningful, manageable and comprehensible, a newly identified sense of coherence might be credited for supporting the PVR group’s self-efficacy gains. Whilst it could also be argued the act of art-making was responsible for improvements to the PVR group’s positive mood (Bell & Robbins, 2007; De Petrillo & Winner, 2005), notably, both groups took part in a drawing activity. As such, like Watkins et al., (2008), study findings highlight the impact and benefits of a positive intervention focus. Here, the PVR group’s sharp upwards spike in positive affect and reduction in perceived negative intensity, may have resulted from the faster and more intense encoding created by the reframed image’s positive and visual emotional content (Lang & Bradley, 2010; Bocanegra & Zeelenberg, 2009). It is also plausible the experimental group’s imaginary and positive visual narrative set in motion a positive rumination or positive uncertainty that could not be ‘undone’ by the conscious analysis we apply to genuine positive experiences (Lyubomirsky, 2006). Here, in the same way that negative uncertainty enhances negativity, positive uncertainly enhances positivity (Bar-Anan et al., 2009) and leads to lasting positive reactions (Wilson, Centerbar, Kermer & Gilbert, 2005). Finally, as positive replay maintains positive emotions (Lyubomirsky, 2006), placing the reframed image in a visible location may have further supported the PVR group’s positive gains. Although the impact of mood induction must be acknowledged, at two-weeks post- intervention, an enhanced mood was unlikely to account for the steady, Time-4 gains to perceived resolution. This may suggest that overall perception shifted in some way. Peak and End Theory demonstrates that perceptions of an experience’s ending are defined by a single moment of peak intensity (Fredrickson, 2000). Subsequently, it is plausible that identifying and positively shifting the intensity of a negative moment may have shifted perceptions of the memory’s ending and led to the increased sense of perceived resolution identified in the PVR group. However, further research that involves visually re-triggering the negative experience (versus mentally as occurred in the present study) would be necessary to settle this interpretation. An unexpected finding of the study was the Time-4 cross-conditions improvements to positive affect, perceived intensity, and perceived resolution. It is arguable this finding reflects a general return to baseline, yet another possible explanation is the beneficial yet more slowly occurring impact of (sensory) exposure to the negative memory (Hayes & Wilson, 1994; Frederick & Loewenstein, 1999) when drawing the original experience. Watkins (2008) argues that open memories remain open due to avoidance of a perceived threat, however, to negate avoidance evoking the object of avoidance is required (Lakoff, 2004; Wegner, Schneider, Carter, & White, 1987). Therefore, it is plausible that for both groups, drawn visual exposure to the negative experience sidestepped the avoidance strategies that typically block the threat of emotional re-experiencing (Conway & Pleydell-Pearce, 2000). Consequently, PVR may present a covert strategy for facilitating the benefits of exposure (Chambless & Ollendick, 2001) and an expedient means of ‘switching off’ the discomforts of this experience. Finally disclosing a negative experience, which despite inducing negative affect and emotional intensity in the short term (Pizarro, 2004; Pennebaker et al., 1988; (Pennebaker, 1993), may be another driving force behind the later, cross-conditions positive gains. Overall, results suggest the subsequent positive emotional effects may outweigh the short-term negative impact (Fredrickson, 1998) of drawing negative experiences and that activating negative memory may be an important and necessary element of positive change. Open memories and negative experiences are easily triggered by emotional and visual cues (Lazarus, 1991) and once activated can lead to a range of negative outcomes (Conway et al., 1994; Peeters, & Czapinski, 1990; Frijda, 1988; Metcalfe, & Mischel, 1999; Bohanek et al., 2005; Bar-Anan, et al., 2009; Abele, 1985; Beike, & Writh-Beaumont, 2005; Allport, & Postman, 1946; Malle, & Knobe, 1997; Klein, & Boals, 2001; Curci et al., 2013). In response, this research presents empirical evidence on the viability of visual interventions and introduces positive visual reframing (PVR) as an efficient and effective, sensory-based model of emotional self-regulation when negative experiences are cued. Whereas previous research identifies adaptive emotional regulatory strategies, such as cognitive reappraisal and positive reframing, as a dispositional response (John & Gross, 2004; Lambert et al., 2009), this study identifies PVR as an adaptive regulatory strategy whose gains are neither disposition nor trait reliant. Although slower and less pronounced, an unexpected outcome of the research was the positive impact of drawing the negative experience. This suggests that visual and sensory exposure to a negative experience may be an important element of later intervention gains. In general, the current study may have benefitted from requesting participants to re-draw, versus mentally recall the original negative experience (as occurred) and return the drawings at Time-4 to ensure all participants were correctly and equally retriggering the negative memory. Also, whereas asking the PVR group to connect with positive feelings during Time-3 was a particular element of the intervention procedure, paralleling this instruction in the control group may have reduced the potential impact of demand effects. A high level of participant attrition was also noted in the study. Whilst it might be argued that those who completed the study were special in some way, it is more likely that the commitment required to independently complete the activity and required measurements at four separate time points was simply a very demanding request. Subsequent explorations of PVR within a contained workshop/classroom setting may yield a higher return ratio. Future research might explore the enduring quality of PVR to disengage and reframe negative experiences as an outcome of the process and/or clarify whether simply reducing the perceptual intensity of an open or negative experience is enough to generate memory closure (Beike & Writh-Beaumont, 2005). Replication studies might explore the mechanisms and impact of PVR by testing cortisol levels or stages of amygdala arousal between activities and conditions. Future research exploring PVR as a clinical intervention, particularly where acute emotional regulation strategies are required, is also recommended. We would like to thank participants of our experiment as well as Itai Ivtzan, who served as supervisor of an earlier version of this work which was presented as a dissertation in partial fulfilment of the requirements for the degree of Master’s in Science of Applied Positive Psychology at the University of East London. Francisco José Eiroa-Orosa has received funding from the European Union’s Framework Programme for Research and Innovation Horizon 2020 (2014-2020) under the Marie Sklodowska-Curie Grant Agreement Nº 654808.